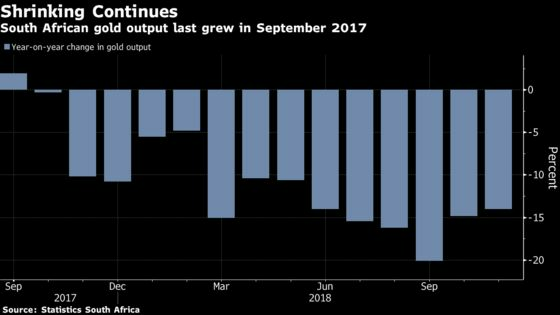 (Bloomberg) -- Gold output in South Africa, once the world’s biggest producer of the metal, fell for a 14th straight month in November, the longest streak of declines since 2012. Production retreated 14 percent from a year earlier, Pretoria-based Statistics South Africa said in a statement on its website Tuesday. Total mining output dropped 5.6 percent from a year earlier, the biggest decrease since August. Production of platinum-group metals increased for a third straight month, rising 0.9 percent. Most of South Africa’s gold mines are unprofitable at current prices. South Africa’s gold industry now employs just over 100,000 people, less than a fifth of the number that used to power the apartheid economy. Higher wages and power prices, combined with the geological challenges of the world’s deepest mines, will mean more job losses and less production in the country over the next five years, Gold Fields Ltd. Chief Executive Officer Nick Holland said last year.